Located in western New York State, about 11 miles east of the Pennsylvania state line (or 20 minutes east of the town of North East, PA) is Westfield, New York. Local train buffs got the towns permission to create a railfan park on the public land between two railroads mainlines. 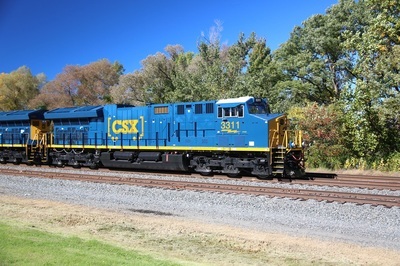 One line is CSX’s former Conrail Chicago Line (Chicago – Cleveland – Boston – New Jersey / NY City), originally New York Central’s Water Level Route between Chicago and New York City. The other is Norfolk Southern’s main between Cleveland, OH and Buffalo, NY once the Nickle Plate Road (NKP) Mainline. 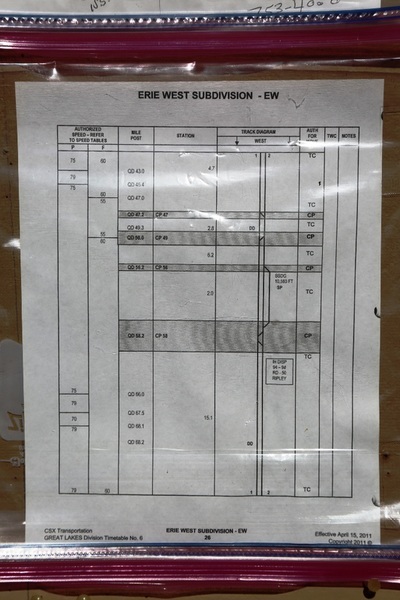 Between the two lines, there are 50 trains during a 24-hour period. 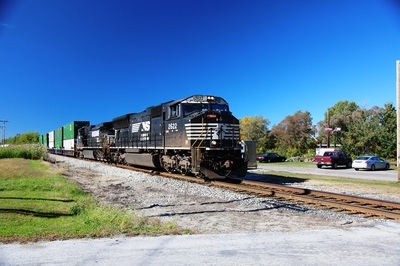 While most traffic is on CSX (about 50 trains daily), Norfolk Southern usually slides a train past every 2 hours on average (figure about 12 trains during 24-hours). Westfield is a small town, located at Exit # 60 off the New York State Thruway (I-90). Gale Street is just north of US-20, it may be best to use to street map or GPS to locate the park. The park consists of a wide open grassy area. Several picnic tables and benches. There is also a barbecue on site. There is no cover for shade or foul weather. You will have to sit in your automobile on stormy days. 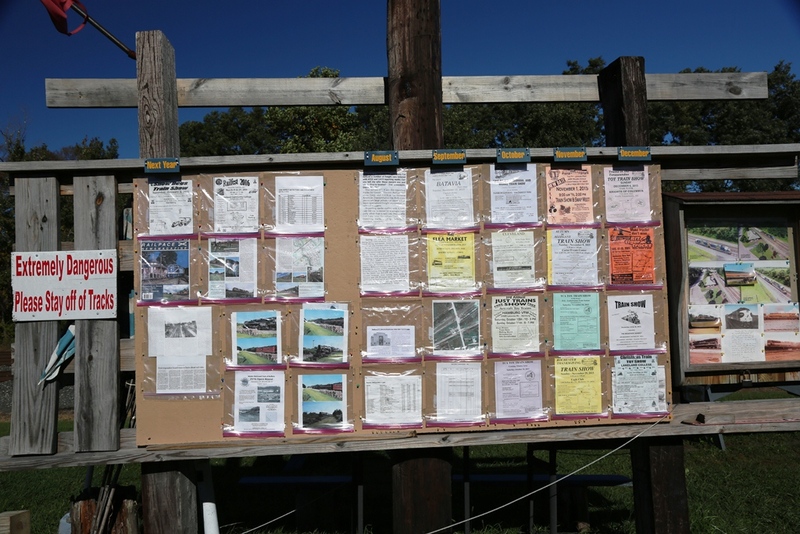 There is a message board for upcoming railfan events, and the story of the creation of the park and info about the rail line including maps and radio frequencies. 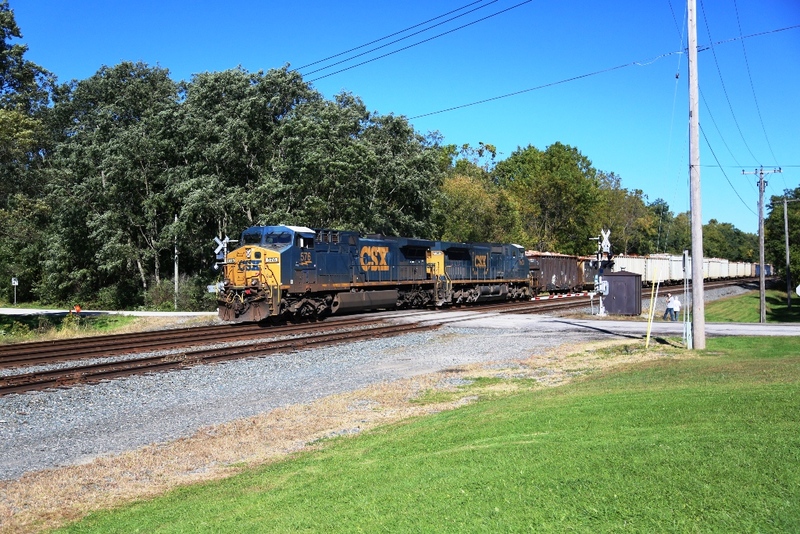 Photography from the park is best during the AM hours, even into the afternoon for CSX trains. 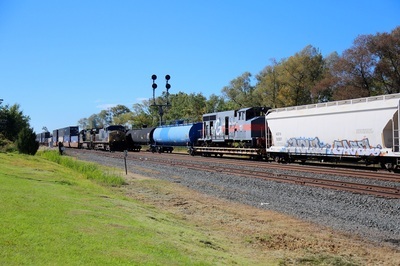 Norfolk Southern is lit best for photos in the late afternoon. 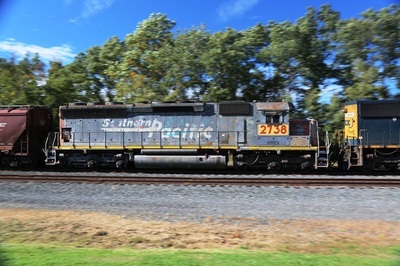 During the morning hours I did photograph some NS trains from the sunny side of the Gale Street crossing, at which time I was greeted by a local mad farmer who gave me a warning saying, “If I step foot off the street onto the grass, he will call the police”. I didn’t, and kept away from his area, but wow did that guy have some mouth! During the afternoon hours, sunlight for good photography is not ideal for neither CSX nor NS. My advice would be to drive 20 minutes south on US-20 to North East, PA. Go to the Lake Shore Railway Museum. 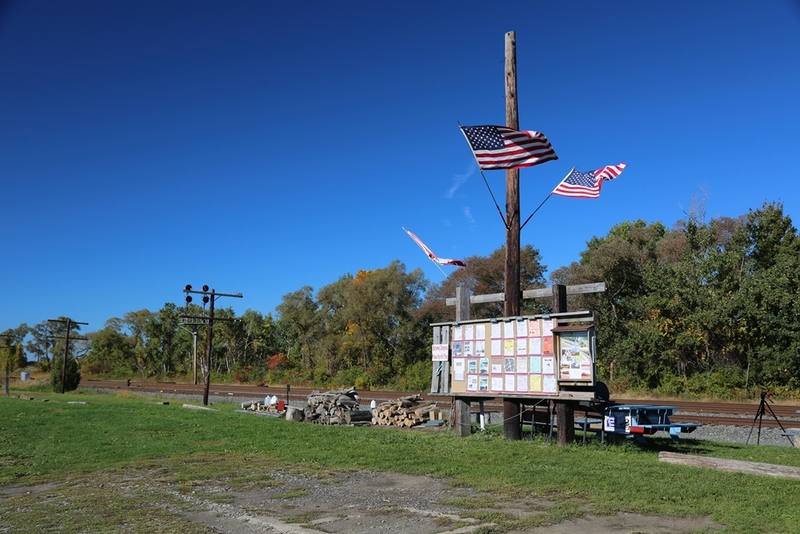 The museum is in a nice setting, plenty of locomotives & rolling stock to view, best of all its located alongside both the same CSX & NS tracks that pass the park in Westfield, AND your again on the sunny side of the tracks in the afternoon! The museum gates seem to stay open into the evening so visitors can watch trains, there is also a live radio scanner feed so you keep up with the action. Benches along the train station building provide a place to relax between trains. This museum is a great place to watch trains all day, but sunny days will drown out photos / video during the morning hours as the museum is located on the west side of the railroads. Rail Traffic: Expect around 50 trains during a 24-hour period. 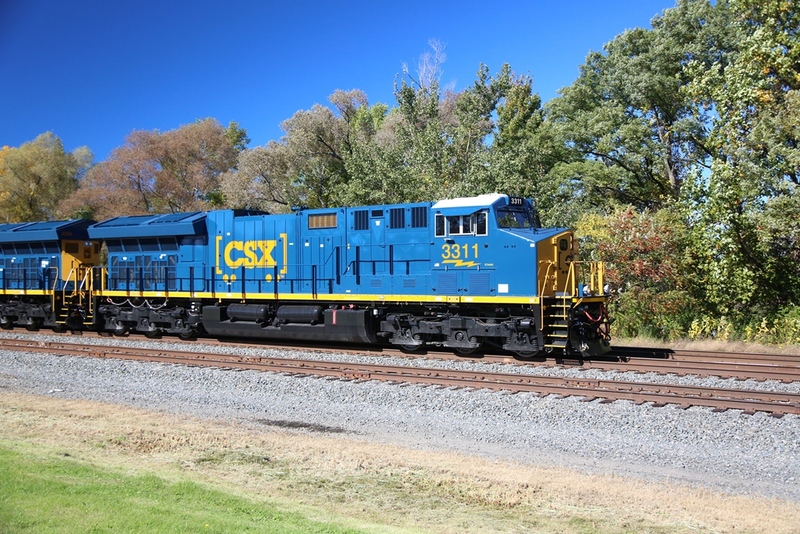 Most trains will be on the CSX line (40 per day). Norfolk Southern runs about 12 trains during 24-hours on average. Amtrak’s Lake Shore Limited (# 48 & # 49) are scheduled to pass Westfield during darkness. However a very late running eastbound # 48 may slide past in early morning light from time to time. Site Details: Located on public property between two active rail lines. 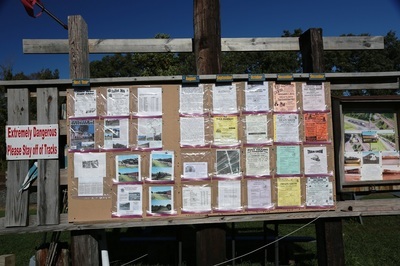 The park consists of a large open grassy area with picnic tables, benches and barbecues. There is no cover from the sun or rain / snow. You will need to use your automobile to shield you from the elements between trains. On cold days, watching trains from your vehicle is an option as the parking area is located at the park with excellent view of both railroads. Restrooms on site: No, a drive into town will be needed. There is a McDonald's in Westfield. Food: None on site or within walking distance. A drive into downtown will be needed for local food or fast food such as McDonald's. Picnic Area: YES, Picnic tables on site as well as some barbecues. Parking: Free parking on site in a gravel parking lot. Yes, you can watch / wait for trains in your automobile. Lighted for evening railfanning: No. Scanner Frequencies: CSX, Amtrak 160.800 / NS 161.250. Motels / Hotels: There are no RailfanMotels in the area. For lodging, there are only a few privately owned hotels / Bed & Breakfasts in Westfield. A pricey Holiday Inn Express is located in North East, PA. Other chain hotels at better rates will be found 45-minutes south in Erie, PA. Tips for a better experience: Since there are no fences, great photography and video can be captured easily. As you would expect, please keep off the tracks & railroad property. Additionally, keep off neighbor’s property as well. 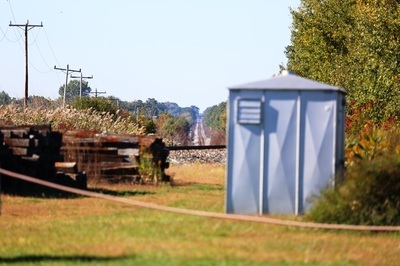 A farmer on the east (south) side of the NS line really hates railfans & visitors. He sits by his window waiting for people to come onto his side of the NS tracks, even if you’re on public property (such as the Gale Street), he will give you an ear full of foul language. A better way of getting much better photos from of the NS line during morning hours is to take a five minute walk down Oak Street, once you curve to the right & pass under the NS line, there is a parking pull off with a great view of the steel railroad trestle that passes over Chautauqua Creek. 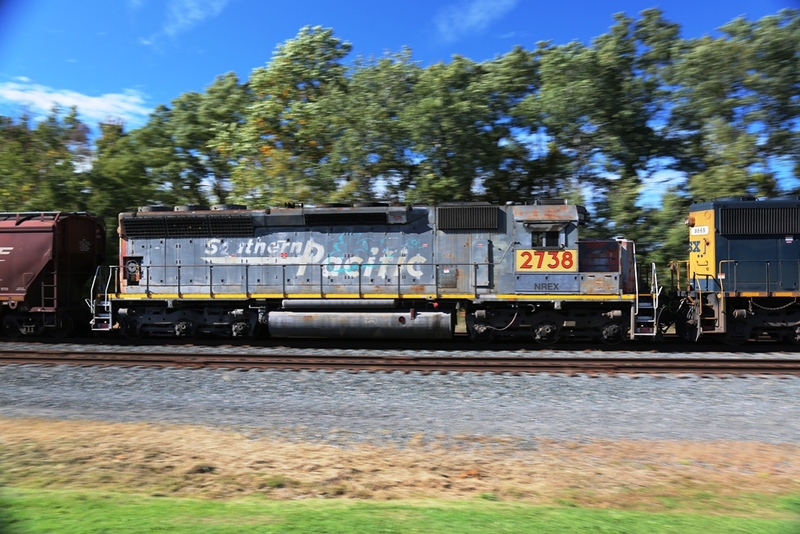 Two things to remember when going down to the trestle are; 1) it best to know when an NS train is coming – otherwise you may be standing for a long time. 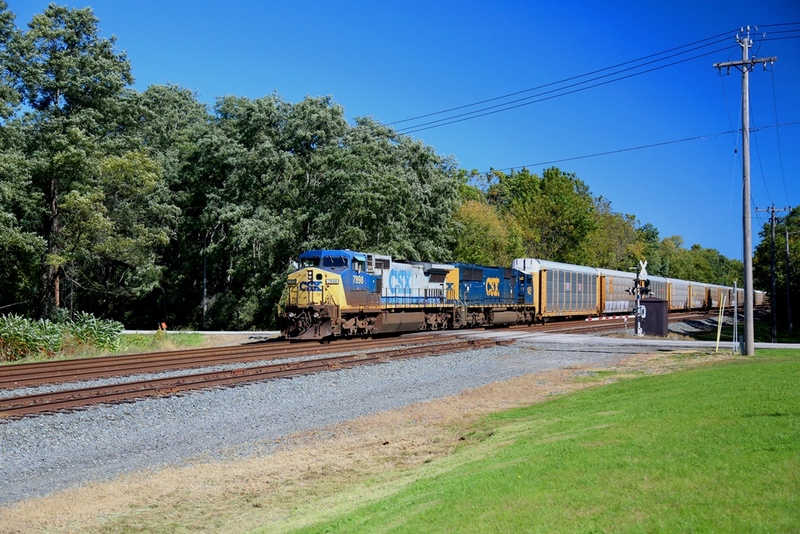 2) You will not see any CSX trains from this spot. 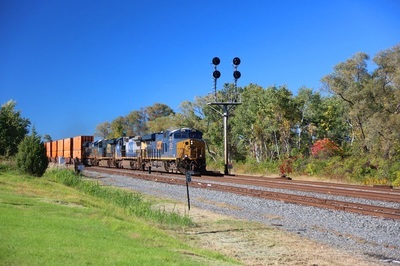 Trains do blow their horns for the Gale Street crossing and can be quite loud without ear protection. Westbound signals on CSX can alert you to upcoming trains. You can look west down the NS line for several miles in search of an eastbound. Binoculars can help you view a westbound signal on NS that may tip you off for future westbound trains on the NS.